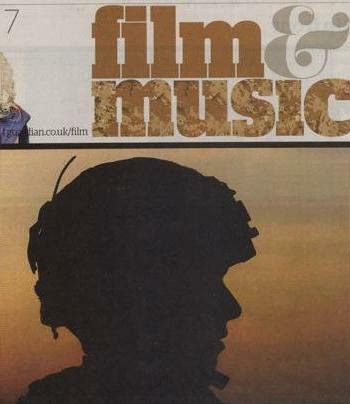 Today sees the last edition, in its present format, of the Film & Music supplement of The Guardian. From next Friday, it is being merged with G2, the features section, and will be edited by a differently configured team. I realise this probably isn't earth-shaking news, but it's a source of genuine sadness to me. I first wrote for the section in 2006, and I feel that a lot of the best work I've ever done on music topics has run in its pages since then. This is in the main down to Michael Hann's inspiring editorship. One of the biggest problems for a music journalist is usually in finding somewhere to place what you know is an interesting idea, but which may not necessarily involve you interviewing a current household name. Michael was one of only a handful of people I've had the pleasure of working for who would commission strong stories, not just stories about stars. Also important: F&M's full-size print pages gave you enough space to tell that story properly. The combination made it an exciting, energising place to write for, and I think everyone - writers, editors, the paper, and hopefully its readers - benefitted from that. The section was frequently praised, and won the Record of the Day award for best music coverage in a newspaper enough times to have kept the trophy for itself. If it had been a standalone music magazine, I'm sure it would have been the best one in the world. While The Guardian will obviously continue to provide film and music coverage, from next week the revamped F&M will be in a smaller printed format, so will surely contain less of it. The individual pieces will presumably be smaller (though I've not seen dummies of the new-look Friday G2, so am just speculating at this stage), and at the time of writing it is far from clear how much of the work will be commissioned from freelance contributors. My suspicion is very little - if any. The background context to these changes is of course the Guardian's continued inability to stem its heavy and ongoing losses. Despite its website's burgeoning reputation and growing readership, the amounts of money coming in to the title are not keeping pace with its expenses, and I guess that continuing to print those extra, separate pages every week had ceased to make any kind of financial sense. Further savings will be made by not having to fill up Friday's G2 with other material, and by getting salaried staff to do more writing (indeed, the one bright spot in all this is that Michael will be doing more writing in future, which is certainly good news for readers). I can see the sense it makes for the paper, but it will mean less material to read, and obviously as one of the people who wrote for the section on a freelance basis, its loss will be keenly felt. A farewell drink for the old format took place last night, and I suppose it's somehow fitting that due to problems on the railway, instead of being there celebrating and commiserating with Michael and the excellent team of writers he'd built (and which I am humbled to have been a part of), I spent the evening on a series of buses and deserted train platforms, out in the cold. There'll be a lot more of that for freelance journalists this year, I expect - metaphorically, if not physically.